Fresh artichokes are a labor of love. I’d like to shake the hand of the first person who thought to eat one. As a member of the thistle family, they come across as rather, shall we say, prickly. And yet! Never judge a book by it’s cover (thank you very much Miss Lippy!). When coddled a bit and treated right, they become downright delicious, with tasty leaves that protect a heart of gold. Huh. Sounds like several people I know. Get ’em while they’re hot, cause the season is short and it’s almost over! Fill a large pot about ¼ full with water, bring to a boil. You want enough water to steam the artichokes without actually allowing the artichokes to touch the water. Make sure the steamer basket is above the water level. Trim the artichokes: start by removing the stem and the top ¼ of the artichoke. As you make each cut, rub the exposed flesh with the leftover lemon half, to prevent browning. Peel off the bottom layer of leaves. Using scissors, cut off the spiky tips of each of the remaining leaves. Cut the artichoke in half, and, using a paring knife, scrape away the “choke” (the fuzzy inner part that looks like hair). 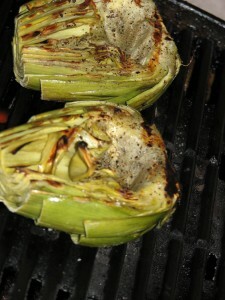 Rub the entire artichoke with the flesh left over from the juiced lemons, and place in the steamer basket. Cover, steam for about 15-20 minutes until the hearts are soft when pierced with a paring knife. While they are steaming, combine half of the lemon juice, the Dijon and the olive oil. Once artichokes are steamed, remove from pot, pat dry with paper towels, brush with olive oil mixture, season liberally with salt and pepper. Transfer to a hot grill, grill pan, or place face up under the broiler. Grill until browned and crispy, about 8 minutes per side. Serve with either of the two dipping sauces below. Combine all ingredients. Let sit for 30 minutes to allow flavors to meld. Combine the lemon juice, Dijon, garlic, salt and pepper. Add oil in a slow stream while whisking. Check for seasoning, stir in parsley.